Field Project Audit – Wings for Kidneys! 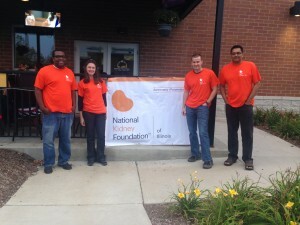 Our team partnered with the National Kidney Foundation of Illinois (NKFI) to raise awareness for kidney disease and the patients and families affected by the illness. 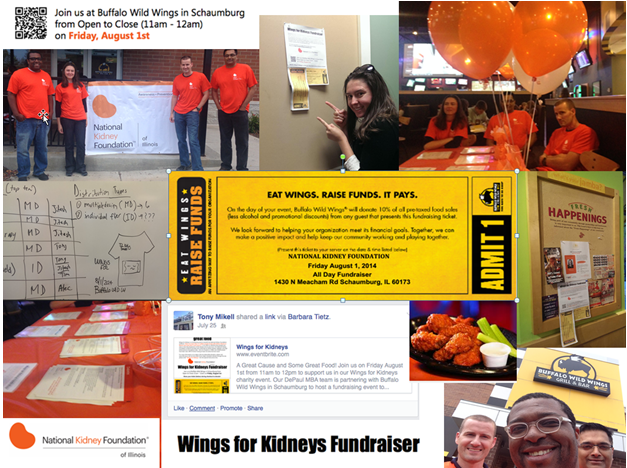 We chose to host our event at a local Buffalo Wild Wings through their Eat Wings, Raise Funds program. By using this program, the restaurant donated 10% of all pre-taxed food sales for diners that turned in a voucher supporting the charity. Our team was present at the restaurant on Friday, August 1st, from 5:30pm to 8:30pm to provide literature on the NKFI. 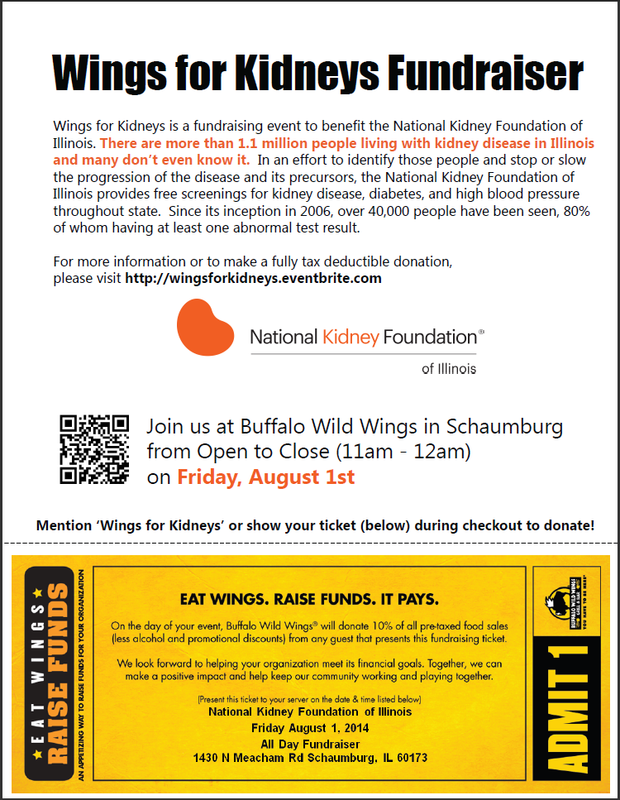 Since the event depended on bringing people into the restaurant, our team distributed vouchers within the Schaumburg community through two channels: printed flyers (including a QR code to drive viewers to our online site) and online networking sites, such as Facebook and LinkedIn, as well as personal email messages to family and friends. We also setup an online donation page via EventBrite to capture funds from people that couldn’t make it out to the restaurant on the day of our event. Objective 1: Raise awareness for Kidney Disease. Objective 2: Provide a financial contribution to the NKFI. Objective 3: Gain applicable experience in project management techniques. In our project proposal we brainstormed ways to raise awareness for the NKFI including: (1) passing out literature to interested parties, and (2) promoting the foundation and the event through social media. Looking back on the project, we were able to accomplish the both our objectives and feel confident that we reached individuals who were not aware of this foundation. In fact, we received a fair amount of questions regarding what the charity does and how they support those with kidney disease. Our best case scenario for the fundraiser was $975 and worst case was $300. We based these numbers on weekly sales reported by Buffalo Wild Wings and the average amount of foot traffic an urban location gets during the week. After tallying our revenue streams including Buffalo Wild Wings vouchers, donor checks, and Eventbrite donations, we passed our worst case scenario with a final tally of $400.00. However, we do not consider the Eat Wings, Raise Funds event alone to be a success as we had quite a low turnout of diners with vouchers at Buffalo Wild Wings. The Eat Wings, Raise Funds event generated only $60.00 (from $600 worth of dining checks) whereas our online campaign through EventBrite and check donors generated $340.00. Participating in this field project enabled us to get hands on experience with the project management techniques covered in class. Since none of us had planned a fundraiser before, these techniques became extremely important in breaking down the project into manageable pieces. Some of the techniques we applied were the work breakdown structure (WBS), Gantt chart, and risk management plan. The WBS helped to organize project ideas and assign responsibility to different parties whereas the Gantt chart allowed us to see where multiple deliverables overlapped, including dependencies throughout the project. In addition, the identification of risks helped to mitigate issues that could have caught us off guard if we didn’t plan ahead of time. As mentioned above, we had a low turnout at the event but were able to recover funds by driving more traffic through our online donations. Charity Selection: Pick a charity that a member of the team has a strong connection with or has dealt with in the past. In addition, it is really important that once you have identified a charity, to ensure there is good support from the charity. The charity that we choose was hesitant to provide support for any 3rd party events, therefore it was difficult to have access to their marketing materials, email distribution, social media channels, or even to receive branded marketing materials to spread the word about the charity. Venue: If you choose to host an event at a restaurant, make sure that they are committed to the cause you are working to support, instead of treating the charity as just another sales channel. 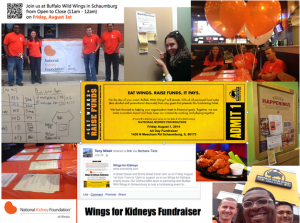 Although Buffalo Wild Wings allowed us to host our event on-site and donated a portion of their revenue to the charity, there wasn’t a strong connection with their management team. When we arrived on the day of the event the manager stopped by once and the servers seemed more concern about losing one of their tables (for us to place our NKFI literature) than learning about our fundraiser. Furthermore, Buffalo Wild Wings is very sensitive about soliciting and we were unable to walk around or greet people in support of the charity. Demographics: Understand the demographics that you want to target. 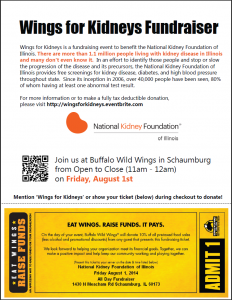 We chose the Schaumburg location thinking we would get a lot of attention from the surrounding mall community, but because of the younger demographic there appeared to be a lack of connection to the NKFI mission. Actually a large portion of diners were teenagers and families with young children. Perhaps a charity with an educational focus rather than a health focus would have allowed us to draw in people to our table. What may appear to be a small project can still accumulate a lot of responsibilities, especially with a small team where multiple people have to matrix across responsibilities. Having good teamwork and collaboration can prevent some of these obstacles. Our team was able to balance project management responsibilities by each taking lead in a particular area and serving support on other tasks when needed. Controlling scope creep is a popular topic in project management, but a lesson we learned is keeping too narrow of a focus can also be a problem. In our team we identified a charity and venue but chose to focus on one restaurant location. Looking back, we feel that we could have targeted multiple locations to make the event more successful. We each live in different parts of the Chicagoland area and could have better leveraged connections within our neighborhood communities. Finally, the WBS was an excellent resource for adding structure and resource allocation to the planning session. While we stuck to our plan and coordinated tasks well, we could have referred back to the WBS and Gantt chart during implementation to track our progress rather than treating them as archived documents. We examined risks very closely in our last class and I can’t think of a better example of risk in project management than those experienced at a startup. As an entrepreneur venturing out on your own, or with a small group, building up a business is a process of trial and error. You can become really passionate about an initial idea but once you’re out in the field talking to customers it may become obvious that the idea doesn’t solve their problem. Then it’s back to the drawing board! Hopefully this realization occurs before you’ve arranged the people and resources needed for the business. Otherwise all the investments you’ve made can become a sunk cost. Many startups today follow a lean model where failure is incorporated into the project. Instead of starting full production on a product, prototypes (or a minimum viable product) are used to get feedback on the product’s functionality. A few, hundreds, or thousands of prototypes may be scrapped in the process. Dyson’s vacuum technology took 5,127 prototypes to get right (Dyson, 2011). Therefore, by testing and retesting ideas before fully going to market, entrepreneurs can mitigate the amount of risk they take on and get to know their customers better. How can we apply the startup approach to project management? Some projects, especially event-based, don’t allow for testing or mock runs. It would be extremely costly to simulate a concert in a particular location along with all the vendors that are scheduled to participate. Yet there are a few key elements from startups that can be applied to project management settings. First, consider addressing risks early on. Even if this can’t be in the form of a prototype the project should be exposed to risks and tested. For example, does the project have enough designers to complete a new mobile app? Estimates may not be enough in this case. Instead the project manager could have the designers solve a small task (subset of the problem or project) together within a limited timeframe to test their capabilities as a team. Additional risks may crop up as a result of their collaboration together. Next, identify metrics that relate to risk. Stakeholders are often focused on budget and deadlines but there are other ways to measure a project. Why not tie metrics into risks that were identified at the outset of a project? In class we discussed the case of Futuronics which carried a greater amount of risk due to their industry and future-oriented products. If the company was able to quantify risks, they could better report on them and gain stakeholder and sponsor attention (Feldman, 2012). For Futuronics, metrics could include number of competitors looking to enter the industry, amount of patents into similar technologies, or number of qualified engineers throughout the country. Lastly a project’s risks should be considered in terms of the overall team and organization culture. If learning and failure are not embraced then it can be harder to have conversations about risk. When the message from the top-down is “We’ve been doing this for years and it’s the right way!” there are natural blockades to identifying and handling risks in projects. Furthermore failure can lead to insights in a project that were not initially considered. What is the most challenging risk you’ve faced in a project? Did you have a contingency plan? Would you be able to put the three elements, mentioned above, to action on projects in your company? Feldman, J. (2012). Project Management Gets Lean. Retrieved from http://www.informationweek.com/applications/project-management-gets-lean/d/d-id/1102570? A project manager (PM) has a challenging enough task to coordinate deadlines, resources, and workflows. Yet with many different personalities and expertise coming together on a project the PM also has a responsibility to build up a team. This soft side of project management, fostering internal team relationships, is crucial to a project’s success. Reflecting on the short time (3 months) I spent covering as a PM for a coworker, I found the soft side of project management to be the hardest. You can have an approved schedule and project plan but if conflicts occur within your team it immediately puts the project at risk. I encountered this recently coming into a team with members that already knew each other. Many of these members were accustomed to working a certain way and challenged changes I made to the plan. Others welcomed my support and guidance. However balancing these two extremes became stressful as I worked to transition the project back to my coworker. In our first class we discussed the Technical and Sociocultural sides of project management (Larson & Gray, p. 17). While this framework is helpful in understanding the combination of hard and soft skills necessary to lead projects, I wanted to seek out additional information on how PMs handle personalities within a team. I discovered an abundance of study on high performance teams (Lake Superior Chapter ASTD, 2014). I also found some workshops focused specifically on this topic, along with other studies on personality assessments and team stages such as Tuckerman’s forming and storming model. Using Porter’s theory to reflect on my own experience I realized that I was so focused on meeting pre-existing deadlines and working within the norms, that I neglected to build a better relationship with the team. Coming into a team as a new member I did not take a step back to reflect on my own motivation. In addition, my perceptions were influencing my reactions to other team members. I often felt like an outsider trying to manage the big picture when other team members had more information being on the project for over a year. Overall I’ve found that understanding your own personality and reaction to others is key in leading a team. If you become wrapped up in the day-to-day work and forget to handle the human side of your team, listening to and motivating others, you are not doing the project justice. What tactics have you found helpful in building up project teams? Are there any project failures you attribute directly to internal team conflicts? Do you think it was possible to overcome them or doomed from the start? Are workshops on high performance teams worthwhile? Would you use the SDI (http://www.strengthdeploymentinventory.com/sdi/about-sdi-an-overview/) for a project team at work? Larson, E. W., & Gray, C. F. (2014). Project Management: The Managerial Process (6th ed.). New York, NY: McGraw-Hill Education.